Let me start my blog by saying this: I LOVE Laos! I seriously do. This country is such a beautiful and peaceful haven for anyone who dreams of an escape from the bustling Hanoi. 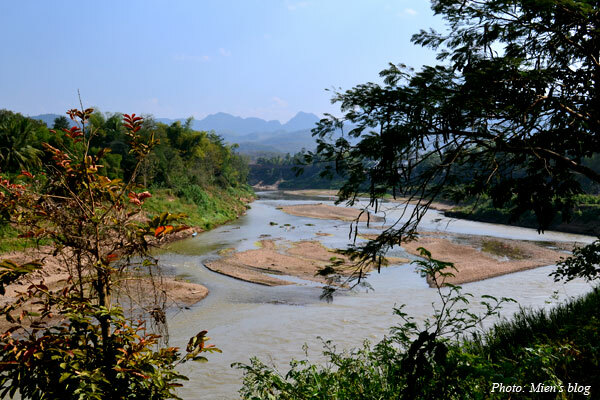 The laid-back lifestyle here has earned Laos its nickname “Lao PDR = Lao Please Don’t Rush”. Everything is sooooo slow here. No, I am not complaining. That’s just a fact and the more I discover the country the more I fall in love with it..
Last year, after coming back from Saigon, I actually even planned to move to Laos, I tried to send my CV around but unfortunately my attempts didn’t work out. It was also a shame to admit that I had lived next to Laos for almost 30 years but never been there once, until 2 weeks ago.. There are only 2 ways to go to Laos from Vietnam: either ridiculously expensive by flights (Vietnam Airlines or Lao Airlines) at the price of roughly US$350 return trips for a total of 1 or 2 hour direct flights or crazily tiring 24-27 hour bus rides from Hanoi to Vientiane/Luang Prabang at about US$50-60 return trips. Cheaper airlines only go from Thailand and Malaysia (AirAsia or NokAir). For me, I didn’t even think twice to pick the bus option. I thought: “Meh, I did the 24 hour train from Delhi to Mumbai before, I can totally handle this”. And yeah I survived. Safe and sound. Can’t say those were pleasant rides though: 24 hours from Hanoi to Vientiane and 27 hours from Luang Prabang to Hanoi. – Bus drivers don’t speak English and won’t care sh*t about you. Vietnamese and Laotians are much better at this bus ride simply because we are smaller and easy to fit in minimal spaces and we seem to be better at suffering from hunger, thirst and being squeezed. Personally, I ate and drank very little during the bus hours to reduce toilet “demand”. Anyway, I think I’ll skip these bus rides next time visiting.. I bought ticket late so I had to sleep on the floor. I shared a small space with another girl. Each of us had 50 cm of the bed’s width. 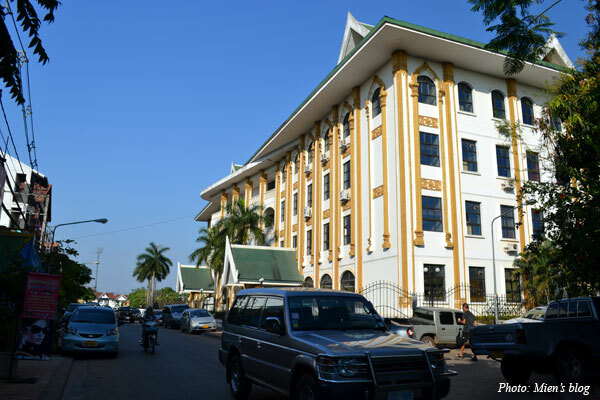 – I bought ticket at 3A Nguyen Gia Thieu, Hai Ba Trung District. Tel: +84 (0) 4 3942 0554. They are quite reliable and offer cheapest price. Buy early to ensure you have a real bed, not having to sleep on the floor, so that you can see the beautiful scenery along the way. Advice is 3-4 weeks in advance. – Ask them the name of the bus station (normally it is Nuoc Ngam Bus station – Bến Xe Nước Ngầm), and ask them to put the number of your seat on the receipt. 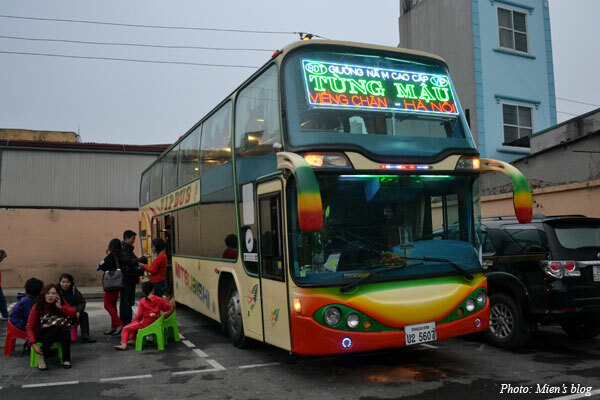 – You can buy tickets from the Nuoc Ngam Bus Station as well, it’s about 14km away from the city center. – Don’t buy return tickets, because normally people travelling to Laos go back from Luang Prabang, not Vientiane. – Change money from Lao-Viet Bank in Vietnam. The exchange rate for Vietnam Dong in exchange booths in Laos is very bad. Or bring USD or EUR with you. – Remember Laos is not THAT cheap. Mostly because Lao currency is quite strong. Then lots of their food and goods are imported from Vietnam, Thailand or China, thus, the price is high. Transportation cost within cities is expensive as well. I spent roughly US$350 for this 8-day trip (in which 3 days I was in buses). Speaking from a Vietnamese backpacker’s perspective that is a lot of money for one single trip. + Vientiane: I stayed at Lovan Guesthouse. Good price, central location, quiet and quite clean. 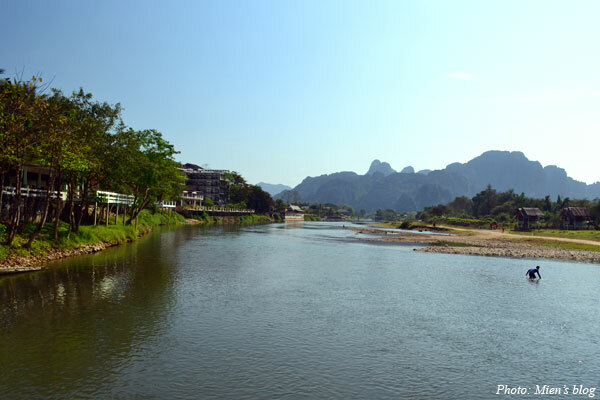 + Vang Vieng: I stayed at Inthira Hotel. Nice one, just too expensive for backpackers. – Best souvenir is Beerlao! There are 2 types: Lao dark and Lao lager. Basically one of the best beer in South East Asia! There are some places in Hanoi that you can find Beerlao too, but of course you can buy in Lao at half of the price. 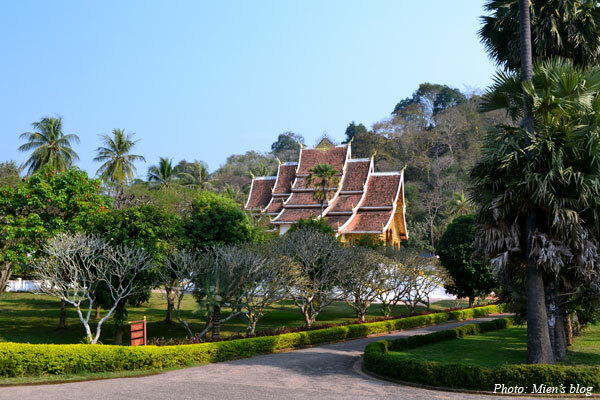 Once you’re in Laos, just take it easy, take it slow, and enjoy! 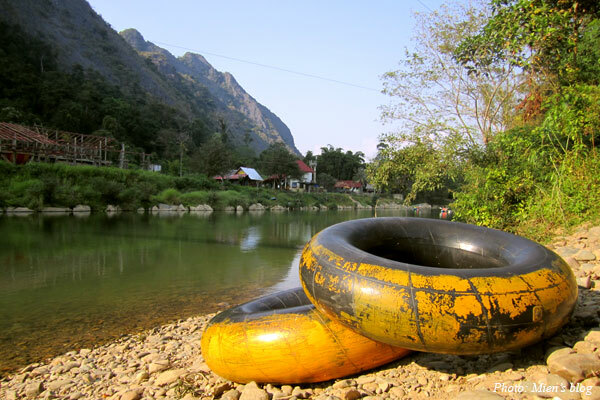 Vang Vieng, the backpackers’ hub, has a lot more activities to offer, such as tubing or kayaking along the pretty Nam Song river, late night parties, exploring caves and lagoons, etc. I rented a motorbike and rode to the Blue Lagoon about 7km from the town. The road was very bad (if that can be called a “road”). The lagoon premise also consists of a large cave. And the fun thing about that cave is that it’s totally dark and tourists need to rent flash lights to go inside. Very much like an adventure! This is a very small beautiful town. Of course the mountains, caves and lagoons there can’t beat those in Northern Vietnam, but still, totally worth visiting and exploring. 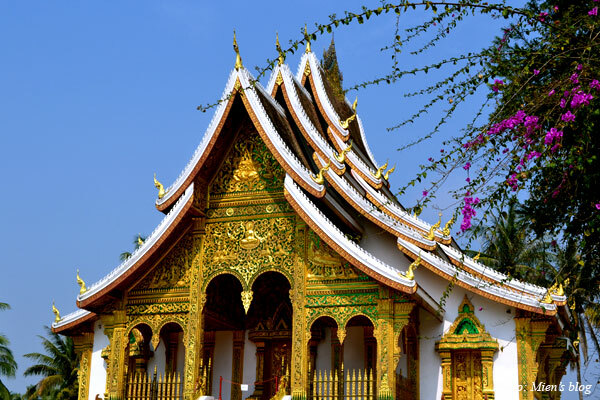 Luang Prabang, the ancient capital of Laos, is the prettiest of all. 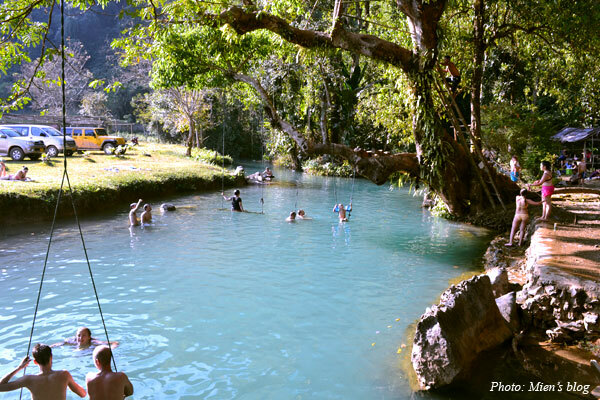 You can’t miss this spot in a Laos trip! The city is located right at the confluence of Mekong River and Nam Khan River, with beautiful old-style houses, delicate pagodas, clean and fresh air. Can’t describe how much I love this place! I missed the Kuang Si Waterfalls and Pak Ou Caves, however, that was not much of a pity. 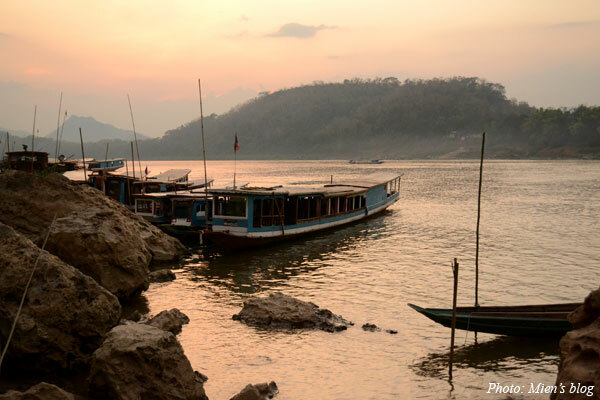 I prefer sitting in a cafe next to the Mekong, feeling the fresh afternoon breezes and adoring the tranquil surroundings. Riding a bicycle around is also a pleasant and relaxing way to explore the town. Then in the evening, there is a big night market selling handicraft goods that you can see in most Asian countries. And at the end of the market, there is a food alley that offer very tasty local food. There is only one thing I feel regret about. I always took night buses to and from Luang Prabang so there was no chance to see the scene on they way which was claimed to be “spectacular”. Thus, after this trip, I have one more thing to put in my bucket list: Take a motorbike road trip from Vang Vieng to Luang Prabang in the next visit. So.. goodbye Laos, till I see you again! 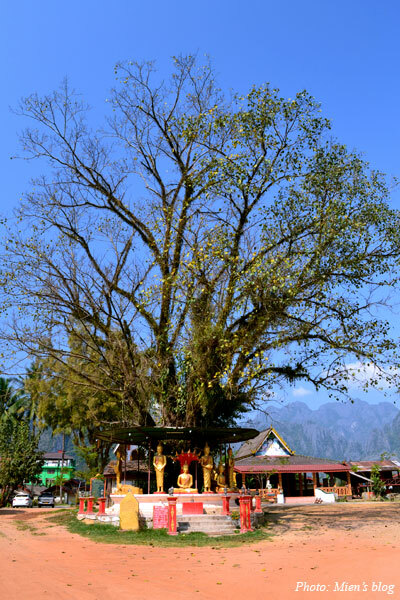 This entry was posted in Abroad Travels and tagged Backpacking, Bus, Laos, Luang Prabang, Vang Vieng, Vietnam Travels. nhìn thành bình quá, có nét gì đó giống Tây Bắc của mình ghê cơ:), lại máu đi Lào rồi đó! Đi Lào đi anh. Đẹp + thanh bình + sạch sẽ cực kỳ. Hay hôm nào huy động đội phượt nhà mình thuê xe máy chạy chuyến Vang Vieng – Luang Prabang đi để em còn thực hiện “bucket list” nào :-P. Nghe nói dịp Tết vừa rồi cũng có nhóm phượt đi xe máy từ Hà Nội sang Lào, Thái và Myanmar trong vòng 1 tuần. Nghe vừa “trâu” vừa chạy sô, mình chả ham. Nhưng mà tuyến Vang Vieng – Luang thì hoàn toàn ok. Chỉ cần lùng thuê đc xe máy tốt tốt 1 tí thôi. 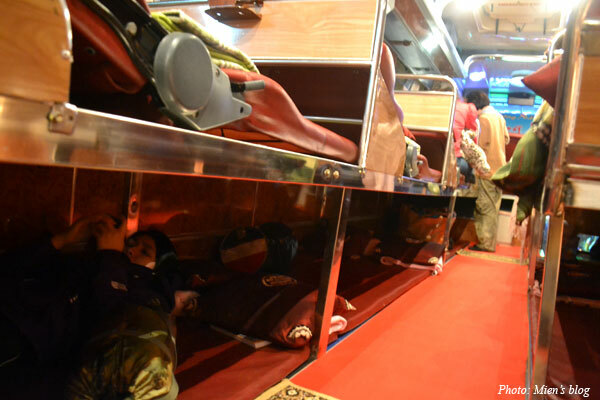 You know, that bus does actually look pretty nice from the outside, I never thought a double decker bus would fit in Vietnam lol….. 24 to 27 hours is too long though. This is a lovely bit of writing and your photos are great too. You know there is another option to get from Hanoi into Laos. If you cross at the Tay Trung border crossing you can then take the Nam Ou all the way to Luang Prabang stopping at Muang Ngoi and Nong Khiaw if you wish. It will be quite a long journey but the scenery along the river is completely worth it. Hi, thanks for swinging by my blog post :-). That sounds like an exciting option, I may look into it for my next Laos trip.. I am an elderly woman, who is living in the US. I will be in VN next week to celebrate Tet. I enjoyed your artical very much. It is very informative and educational. 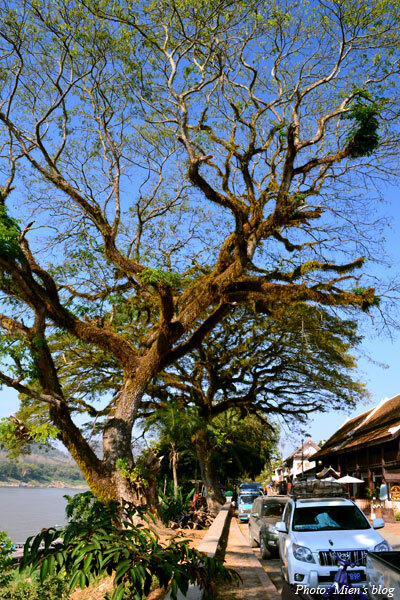 Lao is one of places in my travel plan, and informations you provided will come in handy. Thanks Mien, keep up the good work. Beautifully written and simple to understand. Thank you. What a remarkable trip and useful information. I will be traveling to this part of the world very soon and your blog has given me much useful insight. Thank you for bringing more information to this topic for me. I’m truly grateful and really impressed. Thanks. Thanks for this read. Is there anyway to get from Vientiane to Hanoi without what sounds like a terrible bus trip (from a large number of blogs). Is there not an option to do at least the majority of the trip by train? Thanks for sharing! Your posting and pics are great. It is very useful and informative. I love it! I am planning overland to Hanoi from Vientiane, maybe on end this year or january 2014. Any idea where is the bus ticket I can buy in Vientiane? hi! would u mind tellling me, the best land travel from Luang Prabang to Hanoi, which way ? 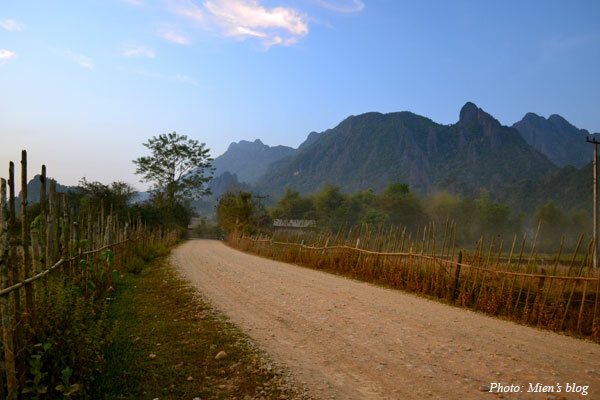 B’coz i think travel from Luang Prabang to Vieng Xai via Sam Neua, then Hanoi. hi! Tania, im going to Hanoi from Luang Prabang. (also my 1st trip) hope can meet u,there. ard early Jan’2015. Cảm ơn Miên. Phần chia sẻ về kinh nghiệm du lịch Lào của bạn thật tuyệt. Mình cũng đã có 1 bài chia sẻ + tổng hợp thêm về kinh nghiệm đi du lịch Lào theo kiểu bụi tuy nhiên các thông tin của bạn còn tuyệt vời hơn. Ảnh cũng rất ấn tượng. Rất vui được học hỏi từ bạn. 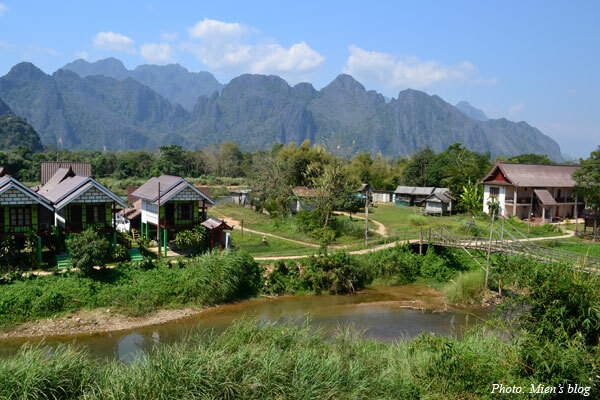 Hey Mien, I’m planning to visit Vang Vieng during my trip to Vientiane next month. What’s the cost of renting a motor bike there? Do they require that you have a license? Hi Nitin, I don’t remember the cost of renting motorbikes in Vang Vieng but reckon it’s not expensive, and they don’t require a license. Just make sure you know how to drive :-). So far I think only in Myanmar you can’t rent a motorbike without a (local) driving license. In Vietnam, technically speaking, it is required that you have a (local) driving license but people often ignore it. Cool. Thanks Mien! I’m visiting Hanoi next week and then doing the arduous bus journey to Vientiane. Your post has been really helpful. 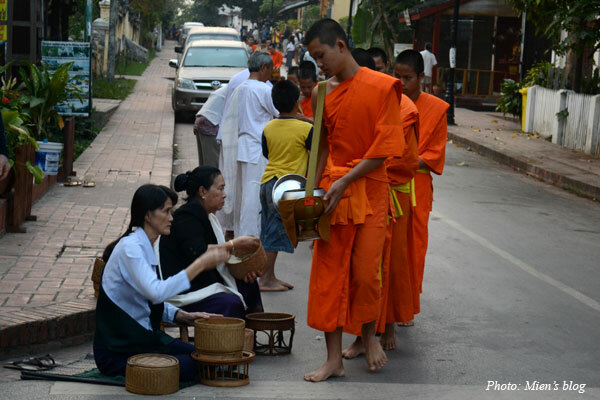 Which month did you travel to Luang Prabang? I don’t know if I go in mid-October or mid-April. Thank you. I really really love Luang Prabang! 🙂 I went in Feb, weather was quite nice then, but I’m not sure about Oct or Apr..
is there overland travel in south of Laos/central vietnam? Not sure about that. I only know the route I took from Hanoi to Vientiane / Luang Prabang. hello, of course you can buy ticket at Nuoc Ngam bus staion. But if they don’t have seats available at the time you will have to wait for the next bus and I don’t know how frequent it would be. Also, Nuoc Ngam bus station is quite a trek from the city center, just so you know..
Hello everyone. Anyone tried crossing borders from Hoi An to Ventianne? Please help. Thank you. Ya! Actually my friends did it and it was terrible! :p just in terms of busing it’s long and unappealing. You switch buses at the border-if you crack under pressure easily or get easily turned around, it will prove adventuresome. Otherwise, just locally as your hotel or hostel for closest bus tour agency and they will point you in the right direction, no sure about price though. Hi, I only went to the places that I wrote above so I’m not sure where else is worth visiting..